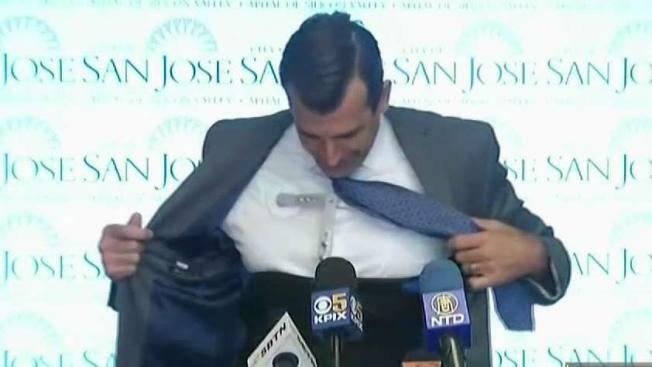 San Jose Mayor Sam Liccardo is back at city hall after he was struck by an SUV on New Year’s Day, the mayor sustained two broken vertebrae and a broken sternum. He jokingly said that he is wearing the latest model of exoskeleton after showing off his brace. San Jose Mayor Sam Liccardo was back at work in City Hall on Monday after being seriously injured in a bike collision on New Year's Day. Liccardo was biking in the 600 block of Salt Lake Drive near the Alum Rock neighborhood when an SUV hit him at about 12:30 p.m. on Jan. 1. The driver remained on scene and neighbors in the area rushed to assist Liccardo. He suffered a fractured sternum and vertebrae, but said he was grateful to be walking with a back brace during a news conference at Regional Medical Center of San Jose, where he was treated and discharged the following day. Liccardo worked from home last week and is back in City Hall to lead this week's City Council meeting on Tuesday. "Happy to join our team at work! #BackInTheSaddle," he tweeted Monday.